Reading Area Bus Routes: Registration changes indicate timetable changes to routes 4, 5, 6, 9, 17, 18, 19, 25, 31, 37, 38, 102, 103, 104, 111, 112, 137, 138, 143, 148 and 149 from 26th March, whilst routes 44 and 45 are withdrawn and new services 23, 24 and 26 are introduced. Oxford Bus Company Fleet List: 105 has been repainted into red/blue the Oxford Bus Company livery, previously being in Park & Ride livery. Meanwhile 801 emerged repainted in Oxford Bus Company red/dark red livery with City 5 branding earlier in the month, previously being in Oxford Red red/dark red experimental livery with route 5 branding. Aldermaston Coaches Fleet List: New in September 2005 was Mercedes-Benz 609D M35 CHS with fleet number 9. H458/9 FLD are confirmed as current, whilst G492 TYS was sold in January 2004. Thanks to Derek Bradfield for this. Courtney Coaches Fleet List: New in December was Optare Solo YJ55 BLV. K155 EJB, R382 GTW, R672 NFR, T137 AUA, X906 RHG, X939 NUB, RO03 JVD, RO03 JVL left the fleet between August 2005 and January 2006 (dates and subsequent owner shown on fleet list). Thanks to Derek Bradfield for this. First Berkshire Fleet List: Loaned 41267 was returned to London on 20th. Thanks to Mat Wooll for this. Horseman Coaches Fleet List: Four 03-reg Iveco / Beulas coaches from Whittle are expected shortly along with three new Toyota / Caetano minicoaches. L953 NWW removed from the list as it has never been in the fleet, W59 SJH is confirmed as still being in the fleet. Thanks to Derek Bradfield for this. Thames Travel Fleet List: New is MAN / MCV AE55 VGO, apparently similar to the two branded for the Hospital Park and Ride. It's fleet number is presumed to be 155 and it seems likely to appear on the enhanced X39 at least in the short term. Meanwhile troublesome 305 is reported to be leaving the fleet shortly. 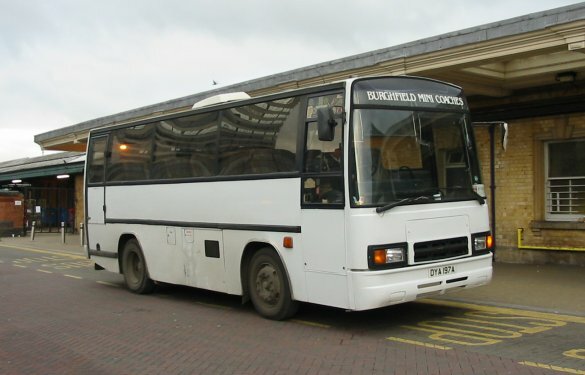 Weavaway Travel Fleet List: B10 MFC was sold to Kinch, Minety and W197 EJO to SM, Harlow in December. Contrary to previous reports there are no further Volvo B9s on order, whilst two further Bova Magiqs are on order for September 2005. B10 MTT and MNX were shown the wrong way around so S331 SET actually became B10 MNX and T725 JHE became B10 MTT. Thanks to Derek Bradfield for this. First in Berkshire Former Vehicle Fleet List: 64813 departed for PVS Barnsley for scrap on 10th. Thanks to Mat Wooll for this. Courtney Coaches Fleet List: T2 CCL has been reregistered T141 LAF pending it's sale. Thanks to Derek Bradfield for this. Reading Optare Solos: The combined Vodafone TH1 and TH2 route that was introduced in September 2005 is numbered TH. Reading Transport Fleet List: Five Scania OmniCity single deckers have been ordered to replace 961-4 on the Thames Valley Park shuttle. They are to be fitted with Euro IV engines, leather seats, air conditioning and coloured LED destination displays. Meanwhile the new Scania OmniDekkas are expected to enter service on 27th March, and with the disposal of the Olympians a second hand bus is being sought for training duties. If no suitable vehicle can be found then 234 may be converted instead. Sources also indicate that negotiations are currently underway regarding the possible sale of a further 10 Optare Excels (901-10) to New Zealand. Reading Transport Fleet List: 704 has a new MegaRear for Westbury Homes. Thanks to James Cusworth for this. Stagecoach in Oxfordshire and Warwickshire Fleet List: Withdrawn Rugby 40160 is now in store at Nuneaton along with 40150/3, whilst Nuneaton 14386 is also back in reserve. 13625 is confirmed as having transferred to Chesterfield. Thanks to Tim Moss for this. Weavaway Travel: Weavaway have taken over Vince Coaches of Burghclere. Four of their vehicles have gone to Moseley in the South (dealer) in exchange for two Bova Magiqs on order for March, with the combined fleet expected to settle at 26 vehicles. No property is included with the deal, and the Vince Coaches identity is to be discontinued. Thanks to RouteONE magazine for this. Stagecoach in Oxfordshire and Warwickshire Fleet List: Following the loss of route 25 in December 42371 and 42732 transferred from Oxford to Witney, with 42386 due to follow. Oxford 40172 will be withdrawn soon, along with Witney 40654, 40657 and 40658. Oxford 40108 and 40110 were withdrawn a few days after the arrival of 42586/8 from Banbury in December. Reading Transport Fleet List: 705 has a new MegaRear for Westbury Homes. Thanks to James Cusworth for this. First Berkshire Fleet List: 68512 was transferred to First Hampshire on 22nd December and accident damaged 64813 has left the fleet. Thanks to Mat Wooll for this.